The MAGIC 2010 challenge requires competitors to demonstrating the use of multi-vehicle robotic teams that can execute an intelligence, surveillance and reconnaissance mission in a dynamic urban environment. 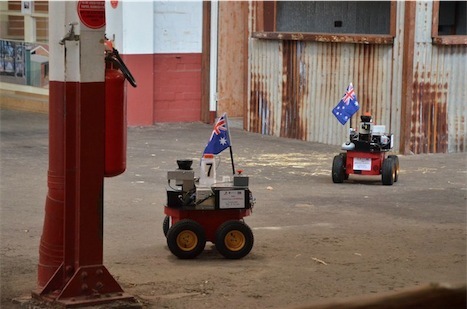 Competitors need to field cooperatives of unmanned vehicles with the ability to autonomously and dynamically coordinate, plan and carry out tasks against changing priorities. complete all phases within 3.5 hours. The challenge event was conducted in Australia during November 2010. Team MAGICian was the first team to compete on the 7th of Nov, and competed the ORSC challenge on the 12th. Photos of the main competition on the 7th were not allowed, however the Old Ram Shed Challenge was open to the media. Five WAMbot robots, all lined up and ready to enter the competition. Rain is spotted on the Radar! The entrance to the Old Ram Shed Challenge. The maze inside the challenge area. The WAMbot robots exploring the area. Frank Ophelders, Lead Operator with the MAGIC HMI judge behind him. Staying calm despite the damage the rain had caused. Frank Ophelders, Adrian Boeing and Robert Reid, with three WAMbot robots. Former DARPA director Tony (Anthony) Tether, and the U.Penn, RASR and WAMbot robots. Adrian Boeing with a RASR Talon and Frank Ophelders with a WAMbot. Adrian Boeing and DARPA director Grace Bochenek. You can read more about the challenge on the DSTO MAGIC 2010 website and see more photos by MAGIC 2010 on Facebook.